Luxurious top-of-the line 4 bedroom 4.5 bath (4 suites) turn-key Mediterranean style home located in the beautiful South Hills Estates. 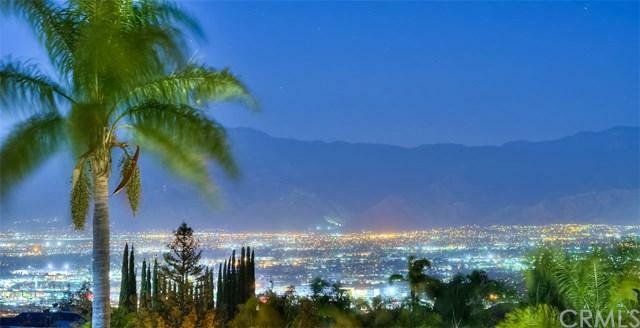 Breathtaking views of the San Gabriel Mountains and city lights. Meticulously maintained grounds with imported courtyard fountains creates a peaceful surrounding. Custom iron fencing and railing positioned around the smooth stucco exterior with precast stone window and door casements. Gorgeous vertical grain Douglas fir garage doors and a double entry door with leaded glass offering a classic curb appeal. Newly renovated master bathroom suite with updated plumbing, new electrical, custom cabinetry, frameless glass shower doors, Calcutta marble counters and tub deck & double-sided fireplace. Throughout the home are 8 foot high wood doors, solid wood casement windows & sliding French doors. Spacious secondary bedrooms with ensuite full baths and walk-in closets. Chef's kitchen with granite countertops and stainless steel appliances; Thermador double ovens, Sub-Zero freezer & refrigerator, gas cooktop, double dishwashers, steam oven, and filter water system. Custom drapery, plantation shutters, designer lighting throughout and a crystal Schonbeck entryway chandelier. Fireplaces in the living room, dining room, family room; wet bar & powder room are perfect for entertaining. Imported Spain tile flooring throughout first floor,limestone staircase with custom stair railing. Abundant storage, zoned HVAC system, and 10 & 11 ft ceilings throughout. Sold by Jenny Xu of Re/Max Masters.